IT'S NEARLY THE END OF THE YEAR! What is this madness? I swear it was only a few months ago when we were coming into 2015 and now we are heading into 2016. 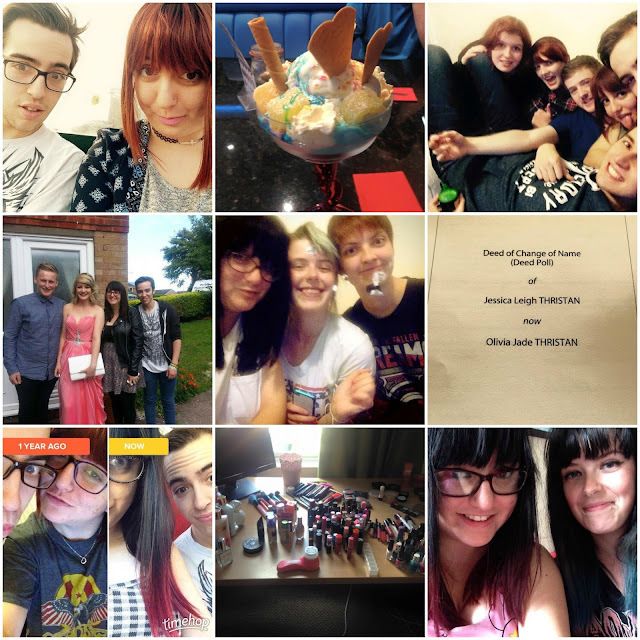 When talking to a friend a few weeks back I realized I've actually done a lot of pretty big things in 2015 as well some smaller things so I thought I'd share them with you, along with a photo collage to share my year in pictures, I hope you enjoy this post as much as I enjoyed writing it! I think 2015 has been a pretty successful year for me, what about you guys? I am huge fan of pampering and think it's a great way to relax after a stressful day or just a nice way to end any day. 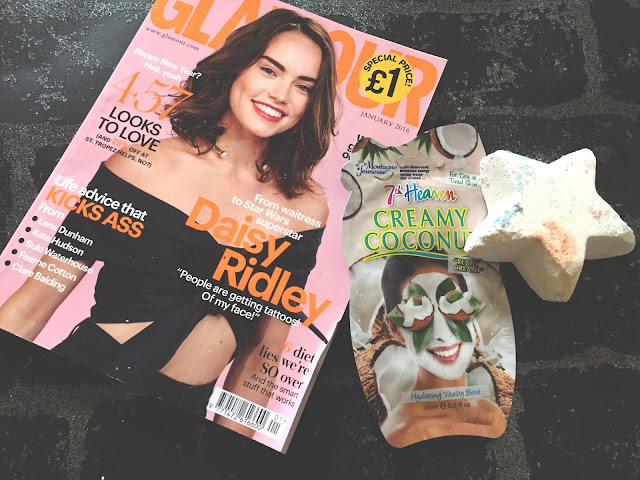 I have so many different products around my room which help with the perfect pamper, I thought I would share with you how I have my perfect pamper and what helps me with that. 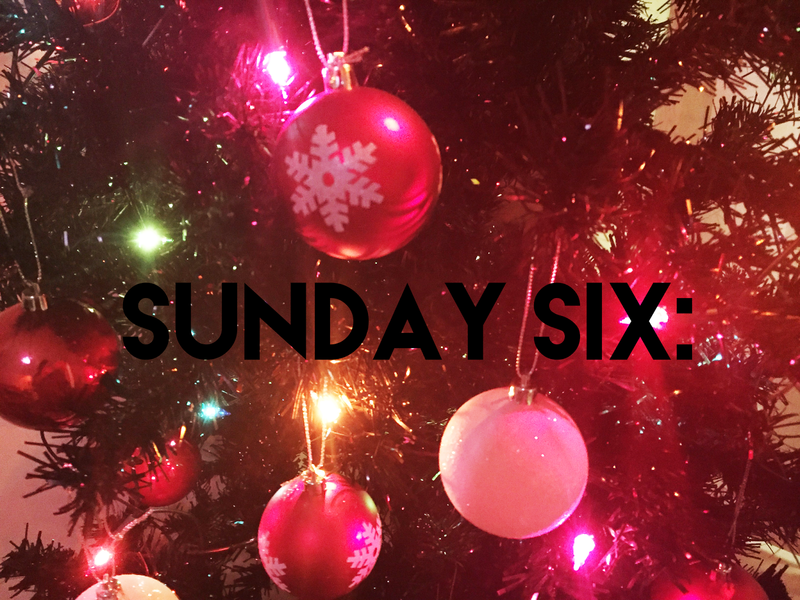 I have done a similar post before and if you fancy having a read of that you can do here or if not, I hope you enjoy this post and give yourself a great pamper sometime in the near future. The first thing I always do when starting out a pamper is run a nice warm bath, and pop a selection of yummy candles around the bath and then start applying a face mask giving it time to set on the face before you get in the bath. 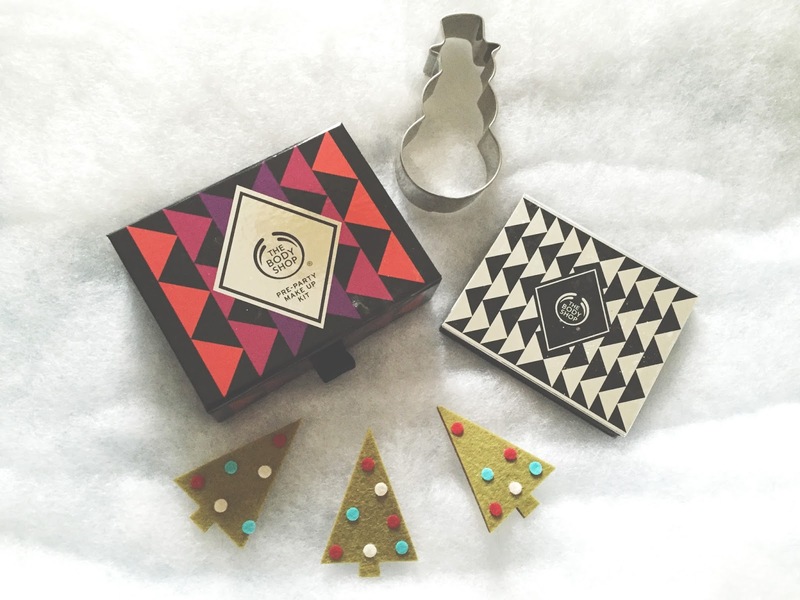 Following this I usually pick a bath bomb or bubble bar from my lovely collection of Lush products, I always stock up ready for when I want a pamper as you can never have too many bath products. Next I will tie my hair up and grab a magazine which I also have a stash of ready for a chill evening and hope that I have a large bar of chocolate somewhere around and head into the bath. Whilst I am in the bath I will take my trusty Magnitone and cleanse my entire body leaving my face until the mask is ready to come off then I will also cleanse my face once I am done with this I will get a towel and pat my face dry and then lay back in the bath and tuck into the chocolate whilst reading the magazine and enjoying the bliss of the candles. Once I've had enough of the bath I will get out and cover myself in body butter usually from The Body Shop, I am currently loving the frosted plum one and it's so wintery and lush and then when it is dry put some comfy PJs and my huge comfy slippers and get on to my bed (oh and blow out the candles too) put some soothing music on and paint my finger and toe nails and once they are dry, I get into bed and watch my favourite TV show and if I haven't eaten yet I'll probably order a pizza to end the evening and if I have I'll likely get some snacks such as Popcorn or my favourite crisps. What do you do for your perfect pamper? Back again with another Sunday Six and I had sooo much fun creating the last one, as you probably are aware it was Christmas two days ago so I decided to make this Sunday six a Christmas styled one and share all things I love about Christmas with you all and I hope you are enjoying these posts as I'd love to keep creating them for you. 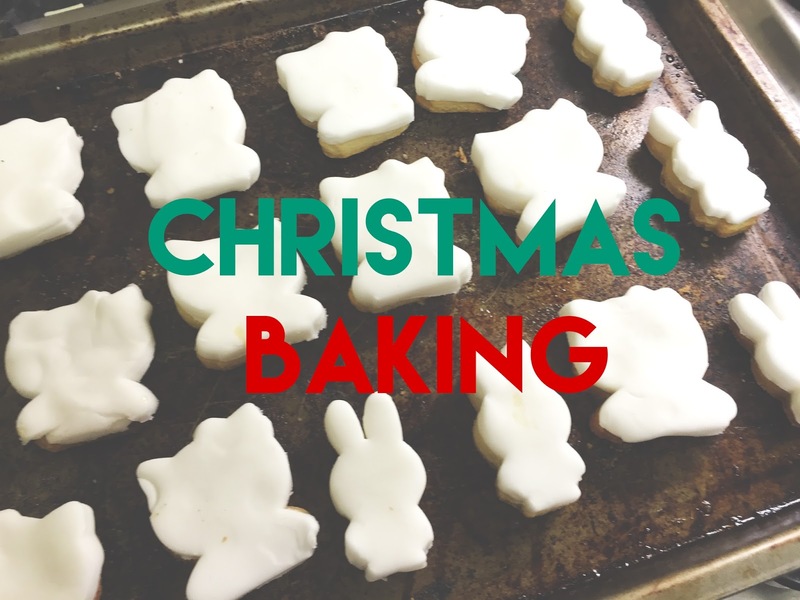 A bit of an impromptu blog post which is quite strange for me as I usually schedule weeks in advance but last night me and Luke decided to do some Christmas baking which actually turned into baking some Miffy and Hello kitty biscuits but they're still pretty cute so I thought I would show you. So last night we went to Asda and bought all of the ingredients you need to make biscuits and also some festive coloured icing as we planned to make bauble biscuits and also some cornflake crispy cakes to go with them. We got home and made the biscuits following a shortbread recipe, and because I am such a fail I ended up putting the baubles too high up in the oven and they ended up burnt as anything and later turned into Frisbees in a food fight. Luckily we found out some cookie cutters I had ordered a while back and not yet used so we ended up making some cute Miffy and Hello kitty biscuits which we planned on turning into mini Santas, although that didn't go to plan either as we got black to fill in the eyes and they looked creepy so we stopped doing that and the Santa jackets didn't look right so as you would we admitted defeat and now just have 20 white biscuits but they're still super cute and yummy! During the time of making these we also made some crispy cakes which is pretty much melting chocolate, chucking corn flakes in and a load of treacle then putting them into cake cases and putting in the fridge these actually turned out okay and I plan to demolish them today. We ended up having a huge roll on icing fight when my friend came back from work and I have several bruises now, who knew roll on icing could hurt so much?! 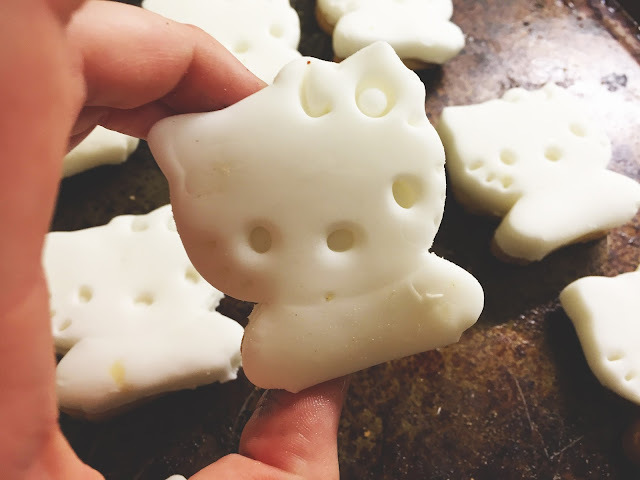 It was still a lot of fun and obviously they wouldn't turn out right as I don't have the patience. I love winter, in my opinion it's one of the best seasons closely followed by Autumn. I love wrapping up warm, and wearing the winter fashions and having the big fluffy socks and onesies on at night so much comfort as opposed to summer which involves wearing less clothes and being super warm all of the time, ew. Today I thought I would share with you my tips for keeping warm this winter, they're all kinda basic so you probably know them anyways but I love doing these kinds of posts and they always seem to go down well, so I hope you enjoy! Tip One- Get all of the jumpers and coats out. I love digging out my big coats and fluffy jumpers ready for winter, and being able to wear them when I go out or when it is cold in the house. It's a perfect staple for any winter outfit being finished with a big warm coat or a cardigan and it looks cute and is super warm. Tip Two- Get a flask. A bit of a different one for you, but having a flask during the winter months is a perfect way to carry around warm liquids to warm you up after being inside. 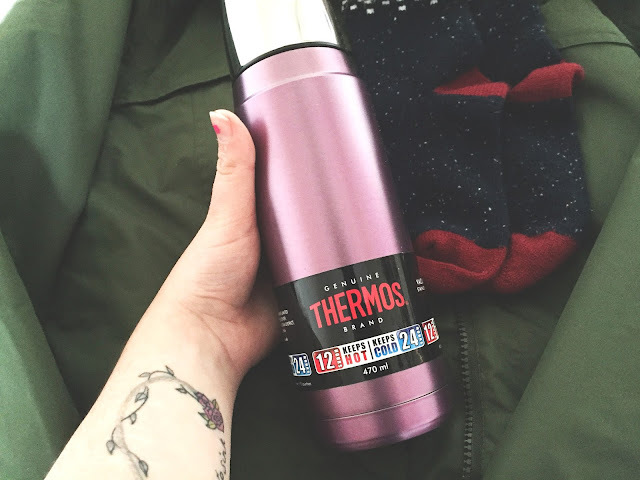 Thermos do some amazing ones in fun colours like pink and purple, I love carrying around soup in mine and it's perfect to drink at university and I am yet to spill it all over myself yet which I totally thought I would do first. Tip Three- Invest in a onesie and fluffy socks. I am yet to meet a person who doesn't own a onesie, but if this is you and you don't own one get one right now, it's something you need during winter for the perfect chill outfit to wear indoors and at night plus who doesn't want to walk around their house as a giant character. Plus get yourself some fluffy socks they are also a must have during winter. Tip Four- Have more baths. Having a bath makes you super warm, and it's a chance to use all of those Lush products you haven't got around to using yet, I love going in the bath when my house is a bit cold or after I've been outside. Jumping in the bath before bed is also amazing as it calms you down and makes you super sleepy. I hope you enjoyed these tips of how to stay warmer this winter! I was recently looking through my old blog posts in aid of scheduling them up for the coming days and saw some of my older posts and cringed at how bad the photo quality is (check them out here and here if you fancy a laugh) and I am sure we've all been there and advancing your photography through your blogging journey is something we have all done I am sure, but I realized the although my photos looked better in the months after this there was still something missing, and that was editing. You can make so many changes after you've taken the photo from subtle ones to something that basically changes the whole photo, I use Photoshop to edit my photos but I know there are many free choices out there which are available to be used. I thought I would share a little insight into my photos before and after and what I do to make them look better, I hope this helps you lovelies and if you fancy more posts like this, do feel free to let me know. 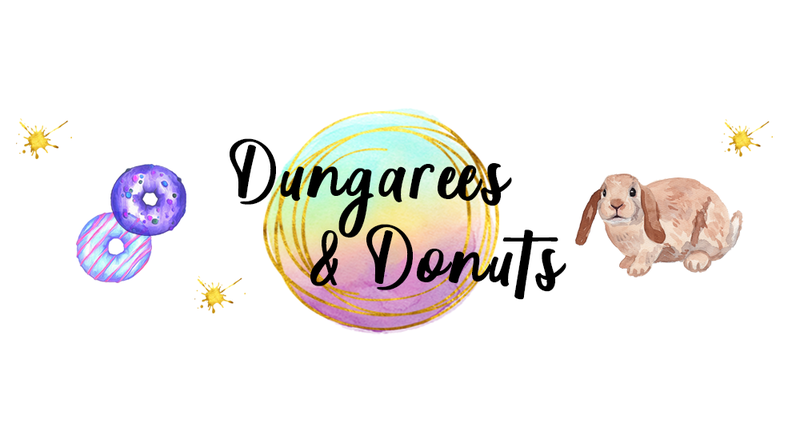 So as you can see in the first photo the lighting wasn't great and it makes the photo look even worse, when I open Photoshop the first thing I do is go over words on pictures and make them stand out more I do this by using the Sharpen Tool. Next I mess with the contrast and the brightness dependant on the photo will depend on how much I mess with them and obviously this photo was very dark before so it needed a lot of brighting but not so much it looks out of focus. Next I use the vibrancy tool which just gives the items in the photo a bit more glamour to them, if you think certain ones need it more than others you can go around them first and just do those. Then after this I use the exposure, I usually start with the brightness adding that final bit of brightness and then the offset exposure which makes your photos look a lot softer and it's perfect for Christmas as it gives them a more Christmas-sy feel. I hope you lovelies found this useful and if you fancy any other editing tips let me know!